High Hamstring Tendonopathy (HHT) is a condition that affects runners. It is most often seen among long distance runners that like to incorporate speed training and hill repeats. It tends to hurt more while running faster and uphill. The pain will typically lessen while running slower and with a shorter stride. What is High Hamstring Tendonopathy? The condition starts out as hamstring tendonitis at the origin of the muscle. 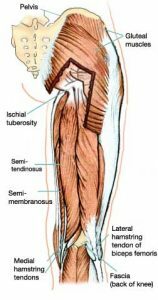 The hamstring muscles originate at your ischial tuberosity near the bottom of your gluteal region. The hamstring tendonitis progresses to hamstring tendonosis which describes thickening and scarring of the hamstring origin. Patients typically report pain in the glutes and hamstring that can radiate down towards the back of their knee. In extreme cases patients report pain while sitting or driving. Most runners mistakenly interpret this hamstring pain as “hamstring tightness” or spasm. They attempt to stretch the area and massage it often only aggravating the problem. Many runners can run with High Hamstring Tendonopathy as long as they run flatter surfaces, run at conversation-pace and avoid steep hills or hill repeats. Many runners with High hamstring Tendonopathy (HHT) have told us that the pain is lessened while running slower and with a shorter stride. If the runner continues to aggravate the High Hamstring Tendonopathy the condition will worsen and could possibly result in an avulsion of the hamstring. There are no “quick-fixes” for High Hamstring Tendonopathy, such as creams or massages. At our clinic we have successfully treated this condition many times. First the runner must commit to regular therapy, slower running, flatter running and no hill repeats. Then a therapeutic treatment program can begin to break down old fibrotic tissue at the hamstring origin using ultrasonic waves and specialized facial release techniques. The patient must also commit to a home stretching and strengthening program. This simple at-home program can be taught to you but YOU MUST DO IT! We cannot do your home program for you. Every case is different but most patients respond to our treatment protocol progressively over the course of 6-12 weeks. If our treatment protocol fails, you may elect to have surgery. Due to complications and possible poor outcomes after surgery it has been my experience that both patients and surgeons would rather avoid surgical intervention. If you are suffering from gluteal and/or hamstring pain and want an accurate diagnosis and treatment options, then call San Diego Running Institute today. Dr. Allen D.C. perform a series of tests to differentiate your condition between sciatica, piriformis syndrome and High Hamstring Tendonopathy. If necessary he will order an MRI to confirm the diagnosis. Dr. Allen D.C. will explain your condition to you in detail and provide you with all possible treatment options. To make an appointment call (858) 268-8525 or TEXT 858-322-8582. For more information email info@sdri.net. All major health insurances are accepted.